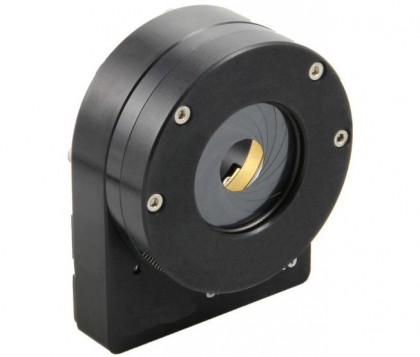 995 Series Motorized Iris Diaphragms are available with various aperture ranges, with apertures from 5 mm to 98 mm. Irises with max. apertures from 5 mm to 27 mm are shown on this page. Irises with max. apertures up to 27 mm close from min. to max. in 1.2 seconds with resolution depending on aperture size (see table below). Zero aperture motorized Iris Diaphragms are available on request, max. aperture sizes from 12 mm to 40 mm.